This cheese is amazing! American ~ Velveeta melts wonderfully too. I always said you can’t make American Cheese but now I know better! If you like to use cheese in hot dishes, grilled cheese sandwiches, melted on eggs or any other recipe that uses an American or Velveeta cheese, this recipe is for you. Of course, it helps if you have a cow, goat or a source for raw milk! 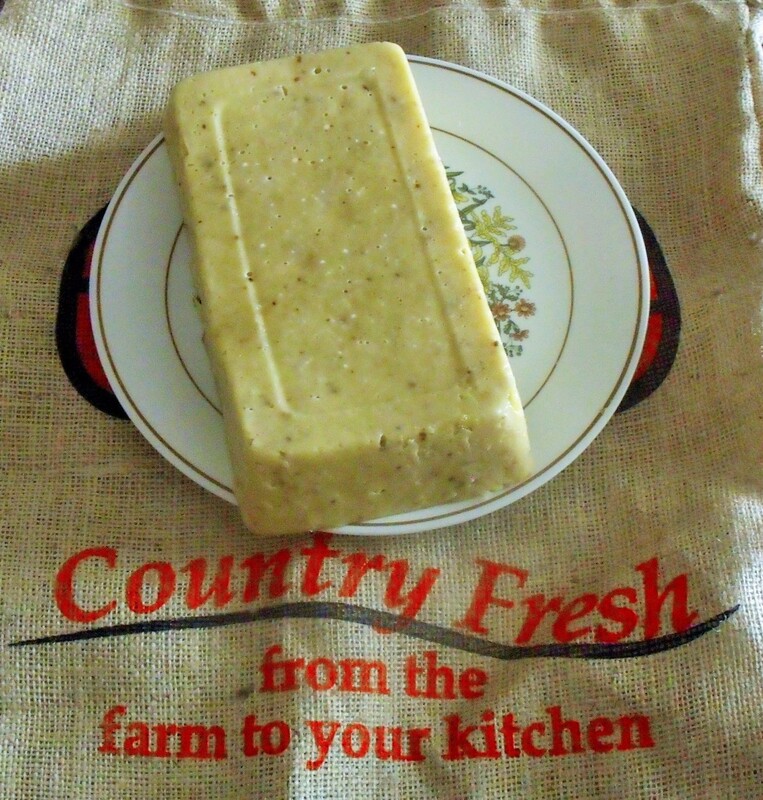 This is one cheese that you can use the same day it is made and it’s very versatile. The block pictured above is a 4 gallon milk amount. I am going to post the directions for 1 gallon of milk. Start small, learn the method and then go up from there, trying 2, 3 and then 4 gallons at a time. The smaller batches are much easier to handle. Warm 1 gallon milk to 140 degrees. Add 2 1/2 teaspoons of citric acid and stir until you get a silky, stretchy and smooth cheese. After the citric acid is added stir until you get all the curds separated. Drain cheese in a stainless strainer for a minimum of 10 minutes. Chop up the cheese in small pieces and place in a pot to melt. 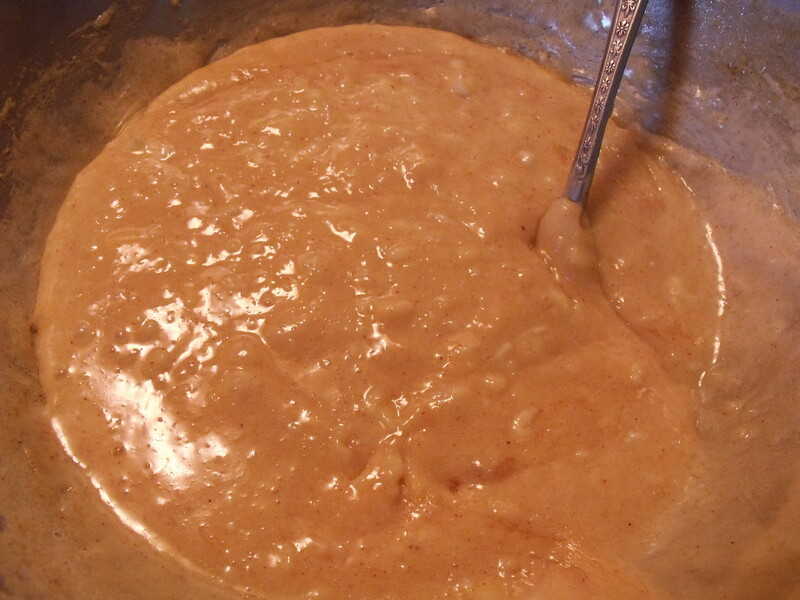 Add 3/4 teaspoon of baking soda, 1 1/2 teaspoons of Sea Salt, 1 tablespoon of butter and 1/4 cup cream ( I guessed the amt. 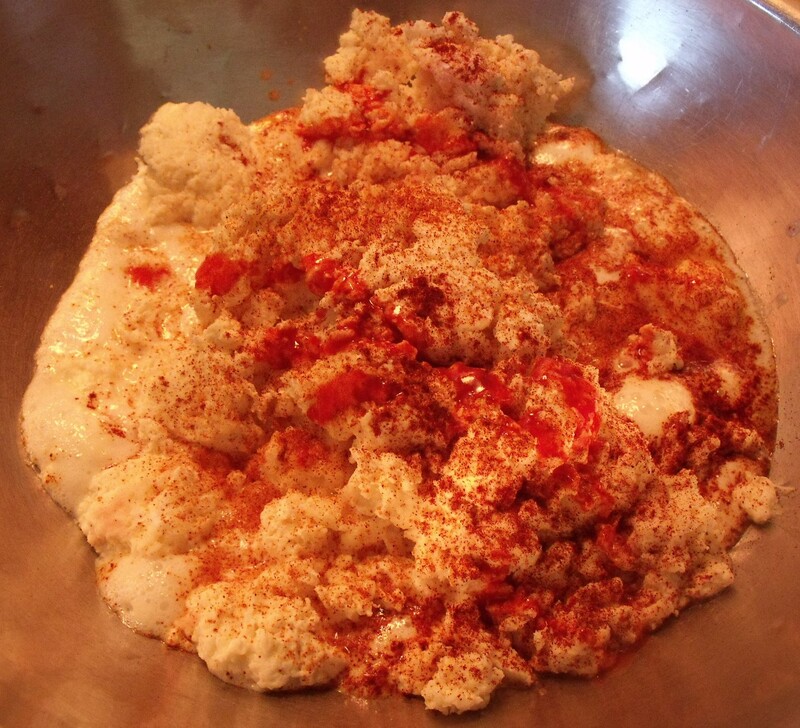 of cream since it can vary) a dash of black pepper and a dash or two of paprika for color. That is the basic recipe. I sometimes add chopped Jalapenos, a tiny shot of garlic or onion powder, red hot sauce etc. You can experiment with what flavor you and your family like. You may want more salt than the recipe calls for as well. 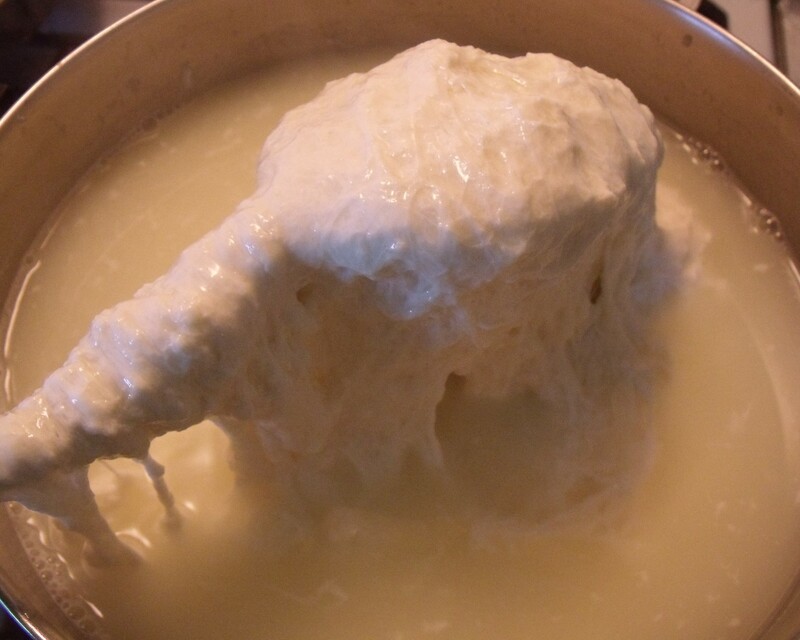 One of my batches of cheese as it is starting to melt and bubble. The red liquid is hot sauce for this particular batch. Stir the cheese on low heat, move it around and around and don’t let it burn. It will make a sticky mess in your pot but if you soak it, the crusty mess comes off easy enough. I used to use a double boiler method but didn’t like how it worked. Mixing the cheese in a pan. When the cheese is smooth, shiny and well blended pour the cheese into a mold. I use my smaller bread pans. The mini bread pans also work great and are the perfect size for a one gallon batch. Fill the pan and let it chill and set up in the refrigerator. When fairly solid you can gently use a knife around the edges loosen the cheese and then use the butter knife to gently pry it out of the mold upside down on a plate. Wrap and use later. This cheese can be melted down later to use as a chip dip as well. Experiment with it and have fun! 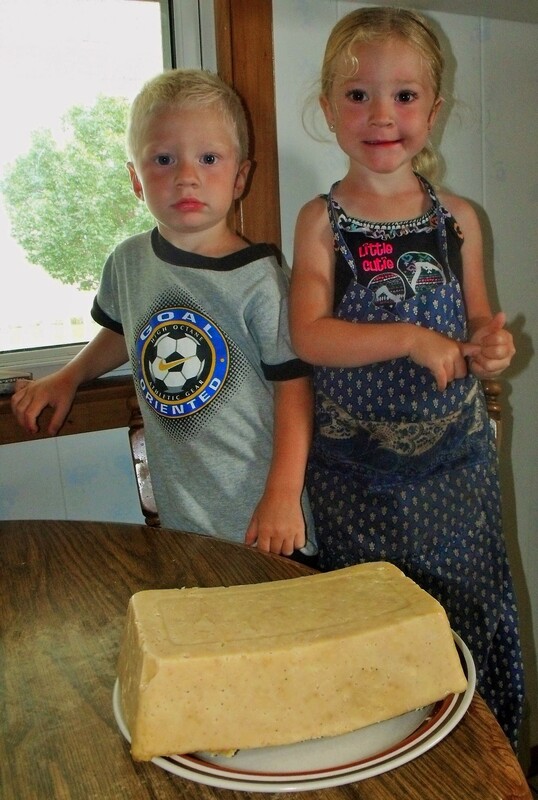 Blasé and Kallie Jo were around to help mess up my kitchen….and test the cheese out too!! This entry was posted in FARM KITCHEN and tagged American Cheese Recipe Callens Honey Farm, Velveeta. Bookmark the permalink. LOL, forget the recipe! I absolutely LOVE, LOVE, LOVE that picture!! How precious is that!